Summary: Although Tag is small, he is determined to become one of the Owls of Valor, practicing fighting with a dagger and shield until he is exhausted. When he and his friend Skyla the squirrel rescue a mysterious egg, they inadvertently get the chance to prove their courage. The egg hatches with a fiery bang, and produces a baby firehawk, an animal thought to be extinct. 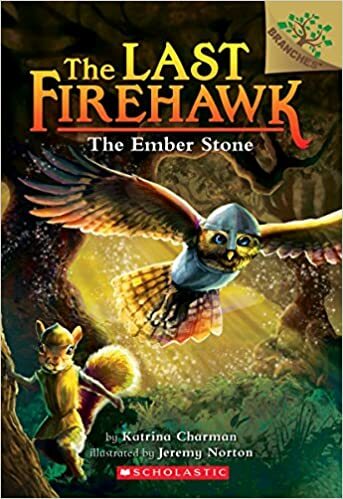 Firehawks were once the guardians of the Ember Stone, which protected the animals from the evil magic of Thorn, a vulture who controls the dark magic of the forest. Tag, Skyla, and the firebird are sent by Grey, leader of the Owls of Valor, to try to find the missing stone. They recover a piece of it, but their journey to find other pieces will continue in the next book. 89 pages; grades 1-4. Pros: Readers too young for animal fantasy series like Warriors will enjoy this latest entry in the Scholastic Branches imprint. It’s a surprisingly interesting, somewhat complex tale, told in 89 illustrated pages, and written at a level appropriate for primary-level reader. Cons: A dagger and shield seem like inefficient weapons for an animal with talons, a beak, and wings.